Noto Almond Torrone for sale. Buy online at Zingerman's Mail Order. Gourmet Gifts. Food Gifts. Noto is a small region in southeastern Sicily. The almonds grown around Noto are some of the most flavorful in the world. They benefit from bountiful sunshine, rich soil, and thick shells that lock in flavor and aroma. That flavor is intense, with that trademark marzipan floral quality. But like many supremely flavorful foods, the trees are low yielding, making the almonds a precious—and not inexpensive—commodity. Almonds from Noto are the star of this torrone. Torrone is the Italian word for nougat—but in Italy, torrone is a treat to be eaten on its own, not just stuffed in a candy bar. It's an ancient confection made across Italy that combines honey, egg whites, and nuts. In northern Italy, like at D. Barbero in the Piedmont, it tends to be crisp and crunchy. 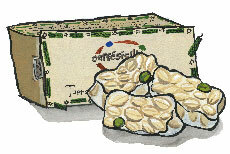 But in Sicily, torrone is soft, with a chewy texture studded with crunchy nuts. The torrone is made by Caffè Sicilia, a fourth-generation pastry shop operating on the main street in the town of Noto since 1892. In addition to Noto almonds, they include an additional pair of flavorful Sicilian ingredients: Bronte pistachios, and honey from the nearby Iblei mountains. The flavor is deep and complex, and the almonds are the star. Caffè Sicilia also makes a pistachio torrone, and it's possible that an bonus pistachio or two may sneak into this almond torrone.